Squirrels in the attic are a common complaint heard at Legacy Rodent Control. If you hear squirrels in your attic, it’s time to call us for expert squirrel removal in Dallas and Fort Worth. We’ll investigate your situation and remove any pests humanely and permanently. Professionals like Legacy Rodent Control understand squirrels and their behavior, and we know that it is critical to keep squirrel mothers with their babies. Our squirrel control process takes care to ensure the humane, live removal of squirrels from your property, and ensures that they will never be able to re-enter and cause damage to your home again. Because squirrel families can be large, the amount of damage done to your property may be significant. 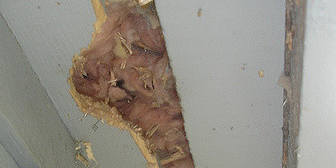 Squirrels target attic insulation and duct work, and many times chew through electrical wires. Squirrels also like to make many entry points, so they can easily come and go when necessary, especially to hide from predators- like humans. We have a three-stage process to remove squirrel infestations from your home. WHY DO YOU HAVE SQUIRRELS IN YOUR ATTIC? Squirrels are small rodents related to prairie dogs and chipmunks. They are found all over the world and in all kinds of environments from the city to the suburbs. They are like any other unwanted pest; they’re opportunists. They are looking for food, a safe place to live and have their babies, and stay warm. As a result, they end up in your attic. Squirrels can jump 8 feet linearly, which means they can make it from trees to your house easily. Once they reach your home, they begin to look for ways they can enter and stash their food findings. When they get inside, they look around and realize your house is a great place to live- and raise their babies. Squirrels give birth twice a year and prefer to have a stable nesting site. Legacy Rodent Control is a squirrel removal company that will remove squirrels from your attic, taking measures to properly seal off their entry points to prevent further infestation. Squirrels are determined creatures, and they will relentlessly try to enter your home after being removed. 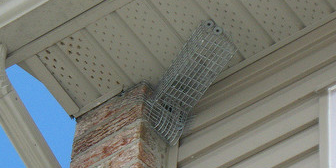 We will cover up their entrances with durable materials designed to withstand squirrels and the outside elements. NOT SURE IF YOU HAVE SQUIRRELS IN YOUR ATTIC? Aside from our list of signs and signal above that may indicate you have a squirrel infestation, other signs include the strong smells of urine or feces, foul odors when using your HVAC system, and stains on your ceilings and drywall. Legacy Rodent Control can investigate your attic and property to determine if you indeed have a squirrel infestation, or an infestation from any other unwanted pests. We provide the highest quality squirrel removal Dallas-Fort Worth has available, and we take the process very seriously. You can trust that we will be thorough in removal and decontamination. Our process is pesticide-free, giving you peace of mind that your family is safe in what is often a very scary time. We pride ourselves on the humane and loving treatment of animals, and we take special care to keep squirrel families intact. We will assess the damage done to your home, and remove nests, debris, and areas contaminated by animal waste. We will use a certified HEPA vacuum to remove feces from impacted attic surfaces, storage areas, and HVAC fans and systems. After physical damage has been removed, we will then clean what you can’t see- the dangerous bacteria left behind. We treat your attic with a fogging treatment, designed to penetrate affected areas to break down animal waste, neutralize odors and animal pheromones, and kill secondary infestations like fleas and ticks that often come along with unwanted pests. In some cases, damage is so severe that your insulation must be removed prior to beginning the decontamination process. Legacy Rodent Control will provide you with a thorough explanation of the reasons prompting insulation removal, and we answer any questions or ease any concerns that you may have along the way. After treatment, we will replace your fiberglass insulation with new materials treated to prevent future infestations. Our goal as a Dallas and Fort Worth squirrel removal company is to provide you peace of mind and protect your health by removing dangerous pests and protecting you from diseases they carry. We know that every infestation is unique, and as such, requires a unique treatment plan. · Droppings around your property or in your attic, that are dark and oblong shaped. For a thorough identification and handling of a squirrel infestation, call Legacy Rodent Control. We will respond quickly to investigate, plan removal, and restore your property. Contact Legacy Rodent Control for squirrel control services today! The first and second stages of our squirrel removal process are completed at the same time. Step one is closing the identified primary and secondary entry points, leaving the main entry point open. We will place a repeating live cage over the main entry point to allow squirrels to enter freely, while simultaneously humanely trapping them. The benefit of this type of trap is that it allows an entire family of squirrels to be removed at once- keeping the whole family together. In some situations, we may install a one-way excluder valve, to allow squirrels to exit on their own, but does not allow them to return. It is important to keep in mind that squirrels are extremely capable creatures, and they will continue to make entry holes to get back inside. Our methods to remove and relocate also include reinforcing vulnerable areas with squirrel proof materials to seal them out. After the squirrel or squirrels are removed, Legacy Rodent Control will completely decontaminate your attic. Our 5-series fogging mist treatment is designed to break down squirrel waste, eliminate pheromones left behind to attract other squirrels, and kill any fleas or mites that accompany squirrels and can plague your home. Once the area is mitigated, we will remove nest, affected insulation, and debris. If you have damaged wiring in your attic, we recommend a thorough restoration in order to prevent further damage, like fires, caused by exposed wires.